Janome 8002D Serger Machine Review - Is this machine any good? Want the perfect machine to serge? The Janome 8002D is all you need! This model has a reputation for being amongst the best. However, despite this, none of us would go and make a purchase right away. Maybe, this is because you’re not sure if the 8002D is the right option. Indeed, we all have different needs and preferences. To find out which suits you the best, purchasing every model to test is a waste and foolish act. Right? To your fortune, we acknowledge this and are here to help you! Realizing that you need in-depth details that come from experience to be sure, we present you this post! 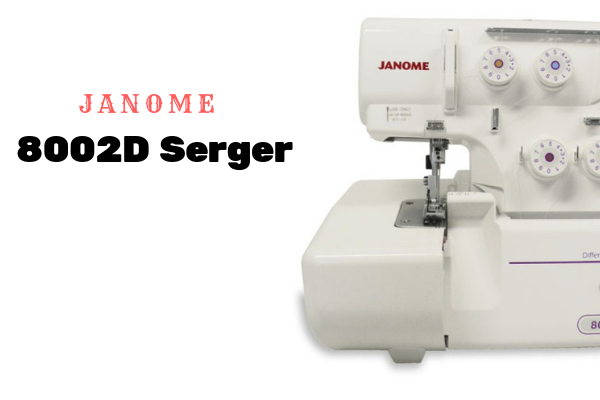 This post specifically talks about the Janome 8002D serger. From purchasing it to testing this machine for you; we have made sure that everything has been covered. The post features everything about the serger. From details like the description to the reviews and places to buy; everything is penned down below. So, this will definitely help you make the correct purchase, right? Keep reading ahead to unravel everything right now! 2.5 Should You Buy The 8002D? 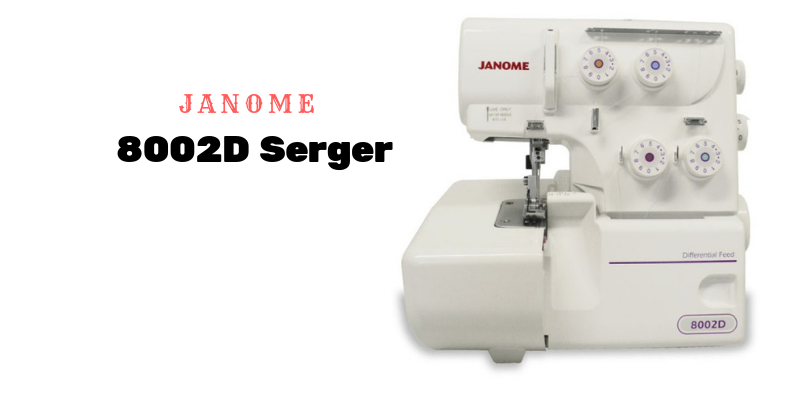 2.6 Where To Buy Janome 8002D serger? The Pine Sewing Machine factory founded in 1921 switched its name to Janome Sewing machine Co. Ltd in 1954. This brand, since then, has a high reputation for being amongst the best brands in town. 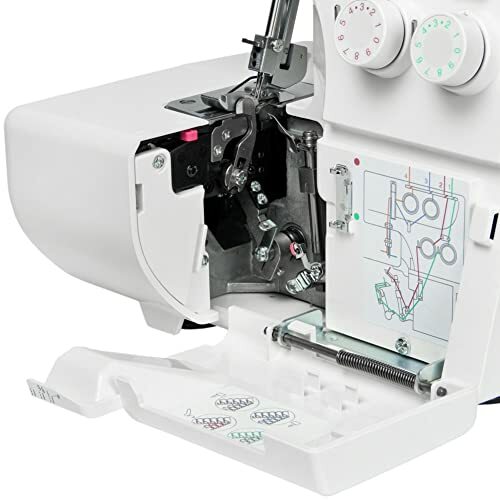 The machines produced by Janome represent creativity and innovation. However, despite this, they remain basic, i.e., easy to use. Furthermore, the brand is well-known in the market for producing high-quality sewing machines. These machines are also budget-friendly, and lie under different category headings. So, the brand has a plethora of options for you to choose from without having to worry about your budget. Do you want a serger that gives a high-end professional touch to your crafts? Then, the Janome 8002D serger machine is definitely the answer! The machine has a vast variety of features that make it stand out of the crowd. Curious to know? Keep going pals, for you shall find out soon! This section enlists all everything that you need to know. From the features of the serger to its looks and specs; you’ll get to know everything! Can’t wait to know if you’ve finally come across the perfect serger for you? Brace yourselves for below is all of it! 3 or 4 threading combination: This serger allows you to convert between 3 and 4 thread combinations. 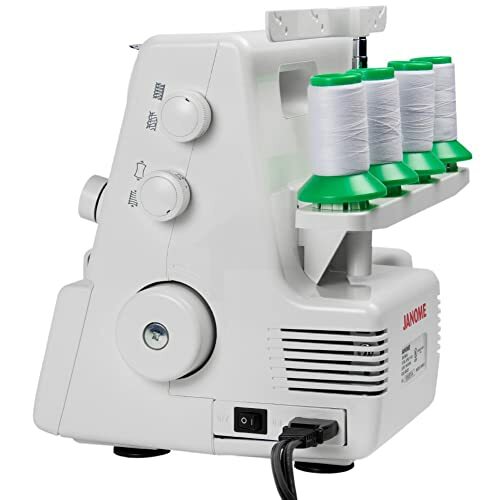 This means that it features 3 and 4 thread overlock stitching compatibility. Thread tension dial: The machine features a lay-in thread tension dial. Threading chart: The model has a very easy-to-read threading chart. 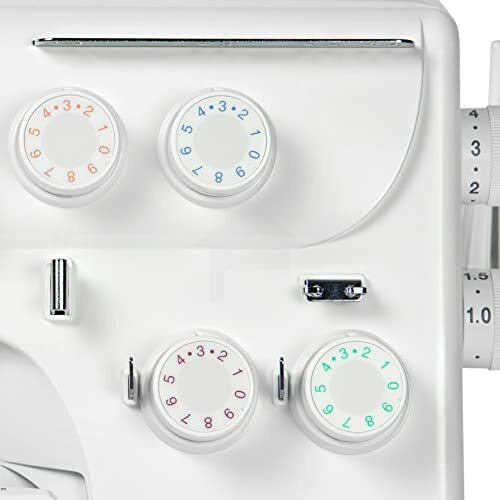 The color coding, as well as the dials, make threading easier than ever! Differential feed adjustment: The machine also offers a range of feed from 0.5 mm to 2.25 mm. So, the the feed mechanism can feed on a number of types of fabrics smoothly, and reliably. Thus, the machine is excessively user-friendly. 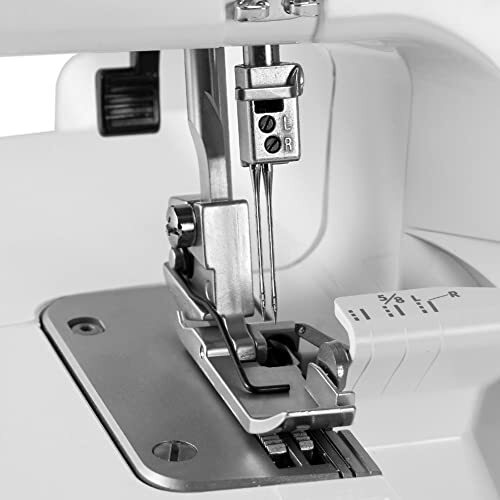 A quick-change rolled hem: Janome 8002D has a quick-change rolled hem. So, you can swap from regular serging to a rolled one without the removal of a needle plate. It also helps you give a better finish to your crafts. Thread guide: A changeable thread guide is available as well. Upper knife: The upper knife is a retractable one. Presser feet: A snap-on presser foot is available. Thread guides: The color-coded thread guides add to the user’s convenience and ease. Foot pressure: Using this serger, you can adjust the foot pressure accordingly. Speed: This model produces up to 1,300 stitches per minute. Adjustable length: You can also customize the length of stitches. You can choose any number from 1mm to 4mm. Bonus package: The product may come with a bonus package. This serger machine has a classy and a very decent look. It also has a design that is creative yet basic and is white in color. Dials are also placed at the front for customer ease as well. Excited to find out what they are? Keep reading ahead! 2 packs of size 14 needles. Should You Buy The 8002D? This serging machine model is very to use and produces highly professional crafts. In fact, with this machine, you can cut, serge, and finish seams in an easy motion. The machine also works at high speed. It is capable of producing 1300 stitches per minute. Indeed, if purchased, we assure you that it would not disappoint! The serger also offers a differential feed adjustment feature. This feature truly lives up to its expectations. Coupled with every feature mentioned above, this serger is a versatile model. Overall, the 8002D is highly user-friendly and has features that are easy to use. This all makes the machine perfect for all the beginners out there! However, is that all? No, not at all! Just like everything has both pros and cons, this serger is no different. To find out more about this, keep reading! Comes pre-threaded with spools of white thread. Features a notch at the back that can act as a handle. It produces good quality stitches. Users have reported tension issues. 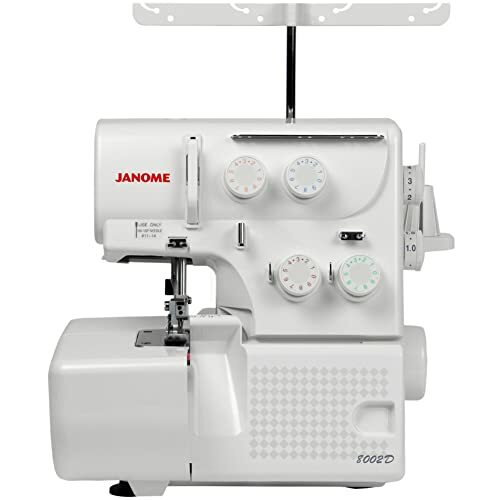 Where To Buy Janome 8002D serger? It’s highly recommended that you place your orders through the official website or official retailers. However, the product can also be purchased from any retailer or shop provided the source is authentic and a trusted or reliable one. Doing so ensures you don’t become a victim of fraud. Generally, Janome products, being highly well-known, are easily available. So it is up to you if you want to purchase it from a local shop or online. So, is this the serger you have been dreaming of? Does it enable you to serge whatever you have always wished for? If yes, then what’s stopping you? Get your hands at the ready, and lay them on the Janome 8002D Serger machine right now! Now that you know all the features, do you think it is something that will help you? Before making a choice, make sure to think thoroughly!